We recently had the pleasure of speaking with Vladimir Cvetković, the head chef at Ambar Balkan Cuisine. This restaurant serves modern cuisine inspired by Balkan tradition, an authentic mix that can be rarely found anywhere else. Naturally, we had to speak to the person that has an active role in curating these meals, and with that the feeling at each table. If you don’t know what I’m talking about, head over to Ambar in Beton Hala! How did you get into cooking and what field did you decide to pursue? When people ask me what field I chose to specialize in, I find myself caught off guard because I never really defined myself precisely. I started getting interested since an early age, I was definitely influenced by my family as my grandfather and mother were both cooks. But the deciding moment in my career was when the show “Oliver’s twist” was airing on TV. I was fascinated! It wasn’t so much the food and ingredients he was using, but the passion towards food, the energy he pours into the meals he makes and the words he uses to describe each element of the dish. That’s when I decided to be a cook. What cuisine do identify with most? That would definitely be Balkan cuisine, which is quite a challenge in terms of using modern preparation techniques. Balkan cuisine is based on tradition, so adding a modern twist is difficult, especially when trying to create a meal that doesn’t leave you feeling heavy and tortured by acid reflux. What I’m trying to do is create a balance when making local dishes, elevating them to a gastronomic and nutritional experience. What is the inspiration behind the Menu here in Ambar? During my career I was attracted to French cuisine and Italian cuisine since it’s quite similar (to Serbian) as they heavily emphasize the family element of each meal. The principal in Ambar is very similar. The dishes are smaller, making them sharable, creating a very familial atmosphere at each table, which is something that is specific to our restaurant that our guests enjoy. In the winter, definitely Sarma. I also love the zucchini and crispy pork, since it is too complicated to make at home, I get to eat it here. What was the most difficult cuisine for you to master? French cuisine is probably the most difficult because it’s technically very demanding and you really have to be precise. You need to precisely add the right amount of salt or else the dish will end up ruined. This is very foreign to our cuisine as we tend to approximate ingredients for a recipe we learned from our grandma. When she says one cup of flour, she knows exactly how much that is since she’s been using the same cup for 25 years. Who was your biggest culinary influence? My biggest influences were definitely the chefs I have worked for. I never had a role model that was intangible. For instance Slobodan Zorić whom I worked under in Novi Sad guided me in French cuisine. I only have 10 years of experience so I mostly learned a lot from my colleagues and superiors. What is currently your favorite ingredient to work with? I never really thought about that. Recently I have focused a lot on vegetables and we introduced a beetroot dish, so will probably experiment with beetroot this summer and winter. Last winter I was fascinated with pumpkin, so I made pumpkin ice cream and various other desserts, so this year I think beetroot will be my thing. The most versatile ingredient is definitely the potato, you can really do anything with it. 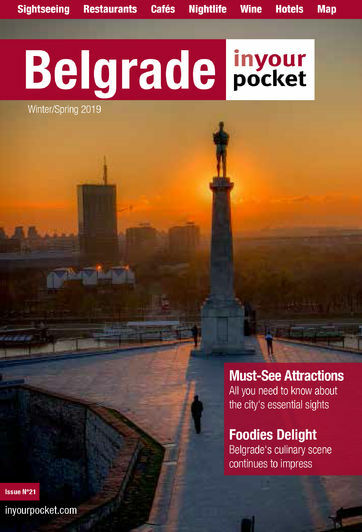 Where do you like to eat in Belgrade? There is a little restaurant in Karaburma called Stara Topola- I really like to go there. It’s small, usually half empty, and the food is as good as any other Kafana. The brass band starts playing at 6pm already, but it has that family ambient that I really like. At one point the waiter’s wife came with his kid, and he was walking around with a tray in one hand and his child in the other. I think that really great.